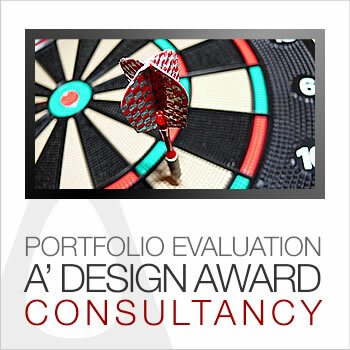 This page explains the portfolio evaluation consultancy service offered by A' Design Award. As a brief summary, this is a consultancy service to help you choose which one of your designs to nominate to A' Design Awards. This service provides a detailed report on every and each of your designs in your product portfolio with a feasibility study regarding the chances of winning the awards. A' Design Award actively communicate its results, exhibits the award winning projects, provides public relation services, publishes a yearbook and the winners are included in the World Design Rankings. Winners are able to communicate their awards in media, newsletters, trade-fairs and point of sales to help further their goals. However, to be successful at A' Design Awards, companies require a well-thought strategy, and know-how to choose which designs to nominate. Furthermore companies should also work on improving the product presentations for a successful participation. 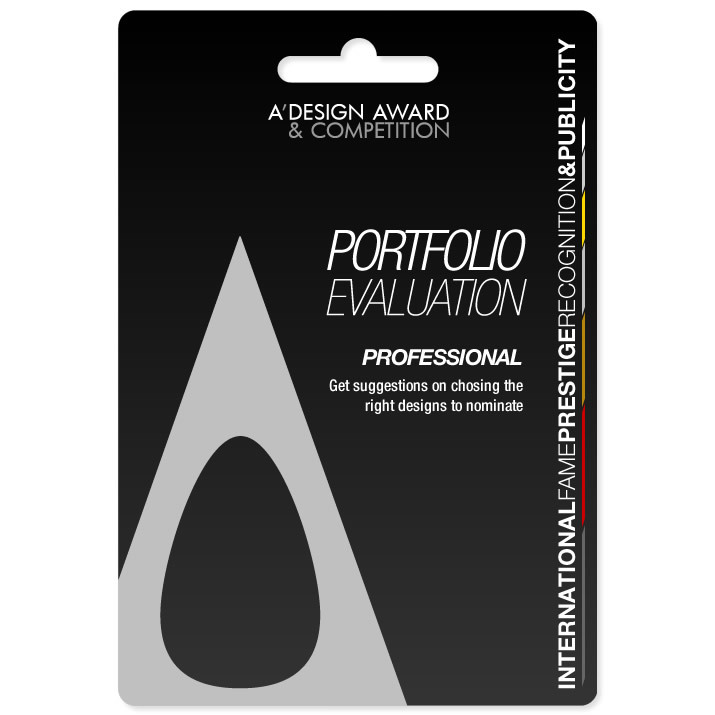 For this purpose, A' Design Awards offers a service called Portfolio Evaluation, which lets applicants to get detailed insights whether and how they could be successful at A' Design Award. The Portfolio Evaluation Service is a consultancy service that lets applicant companies to learn which are the best designs in their portfolio to submit to A' Design Awards. By purchasing this service, companies could decide and submit the works that are more likely to win. The Award Screening service provides you an in-depth feasibility study for an evaluation and analysis of the potential of the proposed entries based on extensive investigation, past experience and research to give full comfort to the decisions makers during the award application process. There are three different packages offered based on portfolio size and the pricing depends on the competition period. Furthermore, applicants are also informed on any active offers or multiple nomination packages that would be used to decrease nomination costs, resulting in further savings and efficiency. 1. Please contact us; the service is not always available and prior booking and confirmation is required. 2. Pay the Visualization Fee by Bank/Wiretransfer or via credit card. To buy the service you need please click the Buy Now button on the table below. 3. Once the payment is complete, we will get in touch with you to take the further steps within the same working day if our offices are open, otherwise we will contact you the next working day. 5 Projects, 2 Days 5 10 € 50 € Buy Now. 10 Projects, 2 Days 10 25 € 250 € Buy Now. 25 Projects, 2 Days 25 25 € 625 € Buy Now. 50 Projects, 2 Days 50 25 € 1.250 € Buy Now. 100 Projects, 3 Days 100 25 € 2.500 € Buy Now. 5 Projects, 2 Days 5 15 € 75 € Buy Now. 10 Projects, 2 Days 10 35 € 350 € Buy Now. 50 Projects, 2 Days 50 35 € 1.750 € Buy Now. 100 Projects, 3 Days 100 35 € 3.500 € Buy Now. 5 Projects, 2 Days 5 20 € 100 € Buy Now. 10 Projects, 2 Days 10 50 € 500 € Buy Now. 25 Projects, 2 Days 25 50 € 1.250 € Buy Now. 50 Projects, 2 Days 50 50 € 2.500 € Buy Now. 100 Projects, 3 Days 100 50 € 5.000 € Buy Now. The micro package includes screening up to 5 projects, and costs 50 to 100 Euros depending on competition period. This package is only made available to independent architects, freelancer designers and solo artists. Designers could expect to receive their award screening and feasibility reports within 2 working days. The micro package is not made available to studios, businesses or enterprises and is 60% discounted to help and encourage upcoming designers to participate in the awards. The mini package includes screening up to 10 projects, and costs 250 to 500 Euros depending on competition period.. This package is especially made available to smaller design studios, newly established architecture offices, and micro enterprises that have less than 10 products. Applicants could expect to receive their award screening and feasibility reports within 2 working days. The studio package includes screening up to 25 projects, and costs 625 to 1250 Euros depending on competition period.. This package is especially made available to design studios, architecture offices, and small enterprises that have less than 25 products. Applicants could expect to receive their award screening and feasibility reports within 2 working days. The corporate package includes screening up to 50 projects, and costs 1.250 to 2.500 Euros depending on competition period.. This package is especially made available to very large design studios, established architecture offices, and larger businesses that have less than 50 products for consideration. Applicants could expect to receive their award screening and feasibility reports within 2 working days. The enterprise package includes screening up to 100 projects, and costs 2.500 to 5.000 Euros depending on competition period.. This package is especially made available to companies that have a rich portfolio of more than 100 products. Enterprises could expect to receive their award screening and feasibility reports within 3 working days. Please note that all of the packages can be ordered multiple times. Service will be performed within several days as indicated. If your company has less designs to evaluate than the ordered package, you could request evaluation of new or further products to be screened within the same competition period. The Complimentary Portfolio Evaluation Service is provided free of charge for several account types based on different conditions as listed below. For each different account type, a different level of service is provided. To benefit from this service, a prior nomination is necessary. The Complimentary version will provide the following information: 1. Expected Submission Score, 2. Expected Chance of Winning, 3. Award Category Suggestion. For this service to be activated please contact support and request further information. For Enterprise Level Members Max. 40 Projects, 3 Days. For Agency Level Members Max. 20 Projects, 2 Days. For Professional Level Members Max. 10 Projects, 2 Days. For Start-Up Level Members Max. 10 Projects, 2 Days.